Cbl-b is an E3 ubiquitin ligase that limits Ag responsiveness in T cells by targeting TCR-inducible signaling molecules. Cbl-b deficiency thus renders T cells hyperresponsive to antigenic stimulation and predisposes individuals toward developing autoimmunity. In part because Cbl-b−/− T cells do not require CD28 costimulation to become activated, and insufficient costimulation is a critical parameter that confers anergy induction over effector differentiation, it has been hypothesized that Cbl-b−/− T cells are resistant to anergy. This possibility has been supported in models in which anergy is normally induced in vitro, or in vivo following exposure to soluble Ag boluses. In the current study, we characterized the response of Cbl-b−/− CD4 T cells in an in vivo system in which anergy is normally induced by a constitutively expressed peripheral self-Ag. Cbl-b expression increased in self-Ag-induced anergic wild-type CD4 T cells, and Cbl-b−/− CD4 T cells underwent more robust proliferation and expansion upon initially encountering cognate self-Ag compared with wild-type counterparts. Nevertheless, both wild-type and Cbl-b−/− CD4 T cells ultimately developed the same impaired ability to respond to antigenic restimulation. The more extensive expansion that occurred during the initial induction of anergy did, however, allow the anergic CD4 T cells to expand to greater numbers when they were functionally resuscitated following replacement of the initial source of tolerizing self-Ag with a viral form of the same Ag. A critical aspect of immune function is the ability to respond to rare pathogen-derived Ags while remaining nonresponsive to more abundant self-Ags. For T cells, this is largely accomplished through negative selection in which thymic APC display ubiquitous and blood-borne self-epitopes to induce apoptosis of cognate developing T cells (1, 2, 3). The range of negative selection is extended by medullary epithelial cells that express nonlymphoid peripheral self-Ags (4, 5); however, this expression is low and sporadic (6), causing many self-reactive T cells to mature and migrate to the periphery (7, 8). In fact, negative selection is incomplete even for T cells that recognize self-Ags expressed at high levels on all APC subtypes (9). Peripheral T cell tolerance mechanisms are thus essential to prevent autoimmunity (10, 11, 12). In contrast to negative selection that is mediated exclusively through apoptosis, several mechanisms contribute to peripheral tolerance. In some cases, naive self-reactive T cells remain unaware of their cognate self-epitopes and can be primed by pathogens expressing cross-reactive epitopes to mediate autoimmunity (13, 14). This ignorance may result from low-level self-Ag expression (15) or sequestration from lymphatic drainage due to expression in exocrine cells such as prostate epithelia (16). Most often, peripheral self-Ags induce cognate T cell nonresponsiveness through a combination of dominant (extrinsic) or recessive (intrinsic/cell autonomous) mechanisms. The quintessential dominant mechanism involves several regulatory T cell populations that block autoreactive effector T cell function. The best characterized express CD4, CD25, CTLA-4, and the folate receptor (referred to as T regulatory cells (Tregs)3 (17, 18, 19)), and can either be selected during thymic development by self-epitopes with moderately high TCR affinity/avidity (20) or induced peripherally (21, 22). Deletion/Apoptosis is the most definitive recessive/intrinsic peripheral tolerance mechanism and can be programmed by members of the TNF/nerve growth factor receptor superfamily such as CD95 (Fas) and other molecules like TNF and DR (23, 24), or through depletion of survival factors like IL-2 (25). Self-reactive T cells can also undergo functional inactivation/anergy in which they become hyporesponsive to antigenic stimulation due to blockages in the TCR signaling apparatus (26, 27). Although deletion and anergy are distinct events, the pathways leading to these outcomes might be linked because anergy and deletion are often observed in the same systems (28, 29). Self-reactive T cells may thus become anergic before undergoing apoptosis, although under certain conditions deletion is incomplete and anergic cells persist (30). Self-reactive T cells in the periphery undergo anergy and deletion because steady-state dendritic cells (DC) cross-presenting cognate parenchymally derived self-epitopes express suboptimal levels of critical costimulatory molecules and cytokines. In contrast, pathogen-reactive T cells expand and acquire effector functions during infection because pathogen-associated molecular patterns induce DC to express optimal levels of cytokines and costimulatory molecules (31, 32, 33, 34, 35, 36, 37). Recent studies have identified several E3 ubiquitin ligases whose expression increases in anergic T cells, and that appear to confer impaired antigenic responsiveness by ubiquitinating specific signaling molecules located downstream of the TCR (38, 39). In particular, Cbl-b can target molecules such as phospholipase C-γ1 (40) and the p85 regulatory subunit of PI3K (41). In addition, Cbl-b-deficient T cells are hyperresponsive to antigenic stimulation, do not require CD28 costimulation to produce IL-2 and proliferate (42, 43), and are less susceptible to negative regulation by TGF-β and Tregs (44, 45). Furthermore, in animal models, ablation or mutation of Cbl-b predisposes toward the development of autoimmunity (40, 42, 43, 46). Given that anergy normally results from TCR stimulation without sufficient costimulation, the ability of Cbl-b−/− T cells to become activated through TCR stimulation independently of costimulation might confer resistance to anergy and hence explain why Cbl-b−/− individuals develop autoimmunity. Consistently, anergic T cells express increased levels of Cbl-b (40, 47, 48), and Cbl-b−/− T cells have been reported to be resistant to anergy (40, 47). These studies, however, used either in vitro systems or in vivo systems in which anergy is induced by soluble Ag boluses. To assess whether Cbl-b regulates CD4 T cell anergy induced by constitutively expressed peripheral self-Ags, in the current study we used our previously established model in which TCR transgenic (Tg) CD4 T cells specific for influenza hemagglutinin (HA) are rapidly and profoundly induced to become anergic following adoptive transfer into mice that express HA in a number of parenchymal organs in which steady-state DC present the cognate MHC class II-restricted HA epitope in a tolerogenic manner (37, 49, 50). Consistent with previous studies, wild-type (WT) TCR Tg CD4 T cells rendered anergic by self-HA expressed increased amounts of Cbl-b mRNA compared with controls, and Cbl-b−/− TCR Tg CD4 T cells expanded more robustly in response to cognate self-Ag compared with WT counterparts. Nevertheless, Cbl-b−/− and WT TCR Tg CD4 T cells became equally impaired in their abilities to respond to antigenic restimulation. Although Cbl-b deficiency did not appear to confer resistance to anergy induction, it did enable a greater number of anergic CD4 T cells to be functionally resuscitated when they were removed from the initial source of tolerizing self-Ag and exposed to a viral form of the same Ag. Thus, Cbl-b deficiency may in part predispose individuals toward developing autoimmunity by increasing the number of anergic self-reactive T cells that have the potential to be functionally resuscitated, rather than preventing the initial induction of anergy. Adoptive transfer recipients received 5 × 105 CFSE-labeled WT TCR Tg CD4 T cells specific for an I-Ed-restricted epitope deriving from influenza (PR8 strain) HA (110SFERFEIFPKE120) that were prepared from CD8-depleted lymph nodes of wild-type (WT) 6.5 TCR Tg mice (51) on the B10.D2 (H-2d) Thy1.1 background, along with an equal number of CFSE-labeled 6.5 TCR Tg CD4 T cells containing a backcrossed homozygous Cbl-b null mutation (43). The two TCR Tg CD4 T cell populations were distinguished from both each other and recipient T cells through the differential expression of congenic Thy1 markers (as detailed in the text). Adoptive transfer recipients included C3-HA Tg mice that express HA under the control of the rat C3(1) promoter that directs HA expression in a variety of parenchymal tissues at either low (self-HAlow (52)) or high (self-HAhigh (49)) amounts, as well as nontransgenic (NT) mice either infected with a recombinant vaccinia virus that expresses HA (viral-HA, 1 × 106 PFU given i.p.) or treated with soluble boluses of the cognate HA peptide (280 μg given i.v. ), as previously described (50, 53). Adoptive retransfers were performed, as previously described (54). The functional response of 6.5 TCR Tg CD4 T cells was analyzed by FACS following recovery from recipient spleens, as previously described (50, 55). Briefly, TCR Tg CD4 T cells (CD4+Thy1.1/1.1 or 1.1/1.2) were analyzed for frequency and CFSE dilution directly ex vivo. Intracellular cytokine staining was performed following restimulation with either the I-Ed-restricted HA peptide or PMA plus ionomycin (PMA plus I) in the presence of brefeldin A for 3 h, and subsequently staining with anti-Thy1.1, anti-Thy1.2, and the appropriate anti-cytokine mAbs following fixation and permeabilization. Cytokine expression plots were generated by gating on Thy1.1+CFSEdiluted cells, and total cytokine expression is expressed in arbitrary units (the percentage of cytokine+ cells multiplied by their mean fluorescence intensity), as previously described (50). mRNA samples prepared from WT TCR Tg CD4 T cells recovered from self-HAlow, self-HAhigh, and viral-HA adoptive transfer recipients and purified by MACS or cell sorting (described in Fig. 5 of Ref. 54) were analyzed by quantitative SYBR Green-based real-time RT-PCR, as previously described (55). Briefly, after reverse transcribing cDNA, T-bet and Cbl-b mRNAs were quantified by first normalizing for input sample amounts by calculating the difference in threshold cycle (CT) values relative to hypoxanthine phosphoribosyltransferase, and then using the ΔΔCT method to calculate the ratio between experimental samples and a representative naive CD4 T cell sample. Primers corresponding to T-bet were previously described (55). Primers corresponding to Cbl-b were forward, 5′-CGTCACCGCAAACTCCAGCTTAAA and reverse, 5′- TCTGAAGGCAAATCATGGCGTCTG. These sequences lack complementarity to other E3 ubiquitin ligases (data not shown). We previously found that when 6.5 TCR Tg CD4 T cells specific for influenza HA are adoptively transferred into C3-HA Tg recipients that express HA as a generic self-Ag in a variety of parenchymal tissues at either low or high levels (self-HAlow and self-HAhigh, respectively), they initially undergo moderate or robust proliferation and expansion, respectively, but subsequently develop an anergic phenotype marked by an impaired ability to proliferate and express cytokines in response to antigenic restimulation. In contrast, when the same HA-specific TCR Tg CD4 T cells are transferred into NT recipients infected with viral-HA, they expand and differentiate into Th1 effectors capable of expressing high levels of IFN-γ, TNF-α, and IL-2 (49, 54, 56). To begin to assess the role of Cbl-b in this tolerogenic response to self-Ag, expression of Cbl-b mRNA was measured by quantitative real-time RT-PCR in samples prepared from TCR Tg CD4 T cells recovered from self-HAlow, self-HAhigh, and viral-HA recipients (Fig. 1⇓). In comparison with naive TCR Tg CD4 T cells, counterparts recovered from self-HAhigh and self-HAlow recipients expressed 2- and 3-fold increased amounts of Cbl-b mRNA, respectively, whereas expression in viral-HA-primed nontolerized Th1 effectors increased only 1.5-fold. 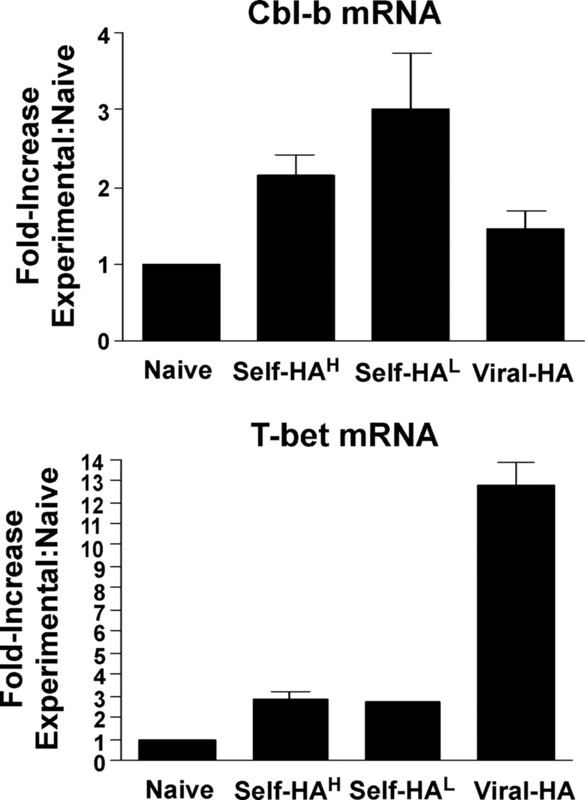 As previously reported (54), expression of T-bet mRNA exhibited a reciprocal pattern in which it was robustly induced in viral-HA-primed Th1 effectors, but only partially induced in self-HA recipients. This trend in which Cbl-b mRNA expression was greater in self-Ag-tolerized compared with virally primed effector CD4 T cells was consistent with previous studies in which Cbl-b expression increased in T cells induced to undergo anergy in vitro or in vivo in response to soluble Ag boluses (40, 47, 48). Cbl-b mRNA expression increases in self-HA-tolerized TCR Tg CD4 T cells. Cbl-b and T-bet mRNAs were measured by quantitative real-time RT-PCR in TCR Tg CD4 T cell samples purified from spleens of viral-HA (n = 9), self-HAlow (self-HAL, n = 3, each determination deriving from 3 pooled recipient samples), and self-HAhigh (self-HAH, n = 12) recipients 6 days following adoptive transfer. (Note that these are the same samples that were analyzed for T-bet and IL-12Rβ2 mRNA expression in Fig. 5, C and D, of Ref. 54 .) Data are expressed as the ratio relative to naive TCR Tg CD4 T cells. To directly assess the role of Cbl-b in regulating tolerance induction to self-HA, a Cbl-b null mutation (43) was backcrossed into the 6.5 TCR Tg background. 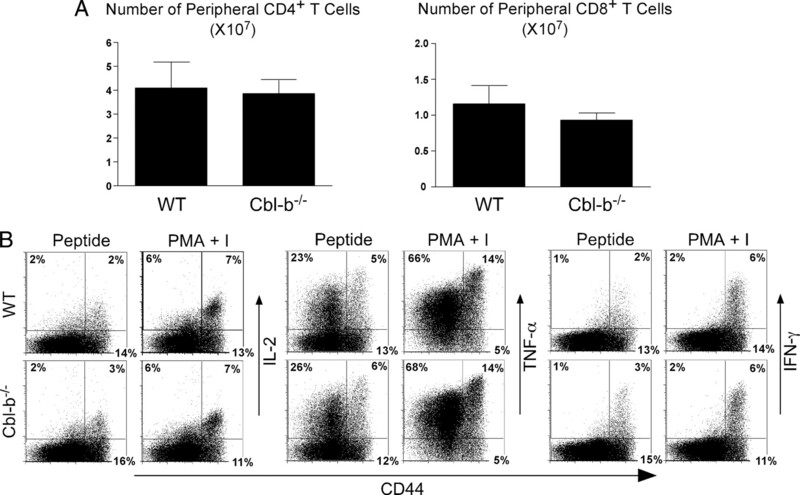 The parental Cbl-b−/− mice have an increased susceptibility toward developing autoimmunity (43), although young (4-mo-old) Cbl-b−/− TCR Tg mice contained similar numbers of peripheral CD4+ and CD8+ cells compared with Cbl-b+/+ (WT) counterparts (Fig. 2⇓A), and within the CD4+ compartment there was a similar proportion of naive (CD44low) and memory (CD44high) subsets that were able to express similar amounts of IL-2, TNF-α, and IFN-γ in response to either HA peptide or PMA plus I stimulation (Fig. 2⇓B). Cbl-b−/− and WT TCR Tg mice also contained similar proportions of peripheral CD4+Foxp3+ cells (data not shown). TCR Tg Cbl-b−/− peripheral T cells are phenotypically and functionally similar to Cbl-b+/+ (WT) counterparts. A, The total number of CD4+ and CD8+ cells in pooled spleen and peripheral lymph nodes from 4-mo-old Cbl-b−/− and WT TCR Tg mice (corresponding to the donors used in Figs. 3–5). B, Cbl-b−/− and WT CD4+ T cells were stimulated with HA peptide or PMA plus I and then stained for surface CD44 and intracellular IL-2, TNF-α, or IFN-γ. Data shown are representative of three independent experiments. Cbl-b−/− and WT TCR Tg CD4 T cells were labeled with CFSE and cotransferred in equal numbers into self-HAlow, self-HAhigh, and viral-HA recipients (Fig. 3⇓). Following recovery from recipient spleens, WT and Cbl-b−/− TCR Tg CD4 T cells were distinguished from each other, and from endogenous recipient-derived CD4 T cells, through their differential expression of congenic Thy1 markers. Thus, WT TCR Tg CD4 T cells were Thy1.1/1.1, Cbl-b−/− CD4 T cells Thy1.1/1.2 and endogenous CD4 T cells Thy1.2/1.2. Functional response of Cbl-b−/− CD4 T cells exposed to cognate self-Ag. CFSE-labeled Cbl-b−/− (Thy1.1/1.2) and WT (Thy1.1/1.1) TCR Tg CD4 T cells were adoptively cotransferred (5 × 105 each) into viral-HA, self-HAlow, and self-HAhigh recipients and then recovered from spleens on day 4. A, Representative histograms of CFSE dilution. B, Expansion is plotted as the total number of TCR Tg CD4 T cells. C, Representative plots of intracellular IL-2, TNF-α, and IFN-γ expression following restimulation with HA peptide. D, Quantitation of cytokine expression corresponding to C. Total intracellular cytokine is expressed in arbitrary units, and was calculated by multiplying the percentage of cytokine expressing TCR Tg CD4 T cells by the corresponding mean fluorescence intensity values. n = 3 for each group, and all quantitative data are expressed as the mean ± SEM. Consistent with our previous studies (49, 54), WT TCR Tg CD4 T cells diluted CFSE almost completely in viral-HA and self-HAhigh recipients, and to a lesser extent in self-HAlow recipients (Fig. 3⇑A). Cbl-b−/− TCR Tg CD4 T cells recovered from self-HAlow recipients exhibited 2-fold increases in both their proportion that underwent CFSE dilution (Fig. 3⇑A), as well as total expansion (Fig. 3⇑B) relative to WT counterparts. Because the proportion of WT TCR Tg CD4 T cells recovered from viral-HA and self-HAhigh recipients that underwent CFSE dilution was already near maximal, it was not unexpected that Cbl-b deficiency did not increase this proportion (Fig. 3⇑A). Nevertheless, similar to self-HAlow recipients, Cbl-b−/− TCR Tg CD4 T cells expanded more robustly in viral-HA and self-HAhigh recipients compared with WT counterparts (Fig. 3⇑B). This observation that Cbl-b−/− CD4 T cells undergo enhanced proliferation and expansion to both tolerogenic and immunogenic forms of cognate Ag is consistent with previous studies documenting that Cbl-b−/− T cells hyperproliferate to antigenic stimulation (40, 42, 43, 57). Despite the enhanced proliferation and expansion of Cbl-b−/− TCR Tg CD4 T cells to self-Ag (Fig. 3⇑, A and B), the functional activity that developed was limited (Fig. 3⇑, C and D). Thus, whereas both WT and Cbl-b−/− TCR Tg CD4 T cells recovered from viral-HA recipients expressed high levels of IL-2, TNF-α, and IFN-γ in response to restimulation with HA peptide, Cbl-b−/− TCR Tg CD4 T cells recovered from both self-HAlow and self-HAhigh recipients expressed very low amounts of all three cytokines that were no greater than in WT counterparts. Similar to what was observed in the spleen, Cbl-b−/− CD4 T cells recovered from lymph nodes and lung (an HA-expressing parenchymal organ (49)) of self-HA recipients were limited in their capacity to express cytokines (data not shown). These results that Cbl-b−/− TCR Tg CD4 T cells exposed to cognate self-Ag possess similarly impaired function as WT counterparts suggested that Cbl-b−/− CD4 T cells are not resistant to peripheral tolerization/anergy. This contrasts with a previous study reporting that Cbl-b−/− T cells are resistant to anergy induced through administration of soluble boluses of cognate Ag (40). To assess whether Cbl-b−/− TCR Tg CD4 T cells in our system might be differentially resistant to anergy induced by endogenous self-Ag vs exogenous soluble Ag, we analyzed the response of WT and Cbl-b−/− TCR Tg CD4 T cells to soluble boluses of HA peptide administered either on 4 consecutive days or once on the day of adoptive transfer (Fig. 4⇓). Not surprisingly, WT TCR Tg CD4 T cells underwent more complete CFSE dilution in response to daily peptide treatment than to a single peptide bolus, and Cbl-b−/− TCR Tg CD4 T cells diluted CFSE and expanded more robustly compared with WT counterparts in response to both peptide regimens (Fig. 4⇓, A and B). 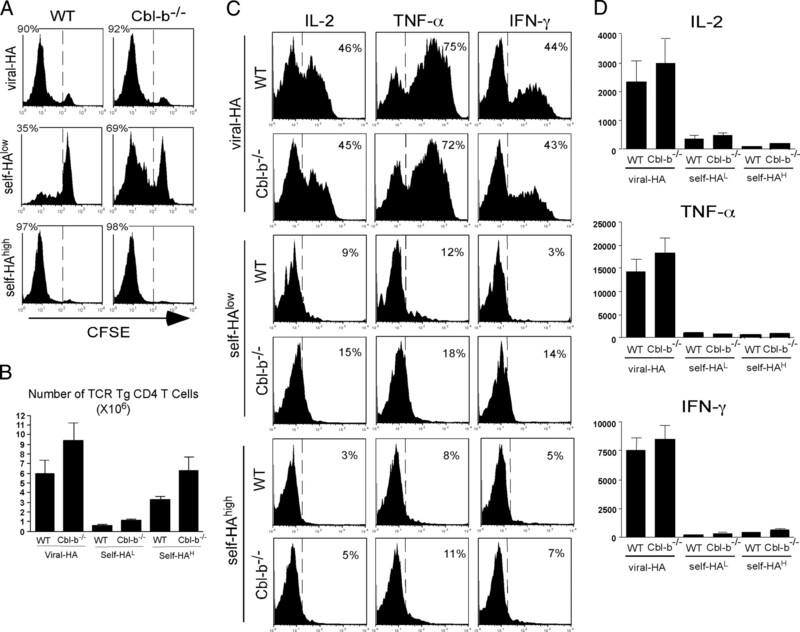 The Cbl-b−/− TCR Tg CD4 T cells did develop a slightly enhanced capacity to express IFN-γ compared with WT counterparts following exposure to both single and daily peptide boluses, although IL-2 and TNF-α expression capacities were comparable in Cbl-b−/− and WT TCR Tg CD4 T cells treated with both peptide regimens (Fig. 4⇓, C and D). Importantly, cytokine expression in soluble peptide-treated Cbl-b−/− TCR Tg CD4 T cells was weak compared with WT TCR Tg CD4 T cells exposed to an immunogenic form of HA Ag (i.e., viral-HA as in Fig. 3⇑C). Thus, Cbl-b deficiency does not confer substantial resistance to soluble peptide-induced anergy. Cbl-b deficiency augments CD4 T cell expansion to cognate soluble peptide, but does not influence functional activity. CFSE-labeled Cbl-b−/− (Thy1.1/1.2) and WT (Thy1.1/1.1) TCR Tg CD4 T cells were adoptively cotransferred (5 × 105 each) into NT recipients treated with boluses of soluble HA peptide given either once on day 0 (1×) or daily from days 0 to 3 (4×), and then recovered from spleens on day 4. A, Representative histograms of CFSE dilution. B, Expansion is plotted as the total number of TCR Tg CD4 T cells. C, Representative plots of intracellular IL-2, TNF-α, and IFN-γ expression following restimulation with HA peptide. D, Total cytokine expression corresponding to C. n = 3 for each group. Anergic T cells can regain responsiveness when no longer in the presence of the tolerizing Ag (58, 59). Thus, although Cbl-b deficiency does not appear to confer resistance to anergy in our system, the capacity of Cbl-b−/− CD4 T cells to expand more extensively during the induction of peripheral tolerance/anergy might allow a greater number to convert back to a functional state. To test this possibility, a strategy was used in which TCR Tg CD4 T cells were first tolerized following adoptive transfer into self-HA recipients, and then functionally resuscitated following retransfer into NT secondary recipients infected with viral-HA (54). Similar to the initial adoptive transfer experiment (Fig. 3⇑), in self-HAhigh primary recipients Cbl-b−/− TCR Tg CD4 T cells underwent greater expansion compared with cotransferred WT counterparts (Fig. 5⇓B), but exhibited comparably impaired abilities to express IL-2, TNF-α, and IFN-γ in response to HA peptide stimulation relative to viral-HA controls (Fig. 5⇓, C and D). It was notable that in the current experiment the Cbl-b−/− TCR Tg CD4 T cells expanded to numbers that were ∼10-fold greater than WT counterparts (Fig. 5⇓B), whereas in the previous experiment this difference was only 2-fold (Fig. 3⇑B), yet in both cases Cbl-b deficiency did not impact cytokine expression capacity. It should be pointed out that in the current experiment HA peptide stimulation induced weaker cytokine expression in all groups compared with stimulation with PMA plus I, which most likely resulted from limiting Ag presentation caused by the high ratio of specific CD4 T cells to APCs that resulted from the dramatically enhanced T cell expansion (as where PMA plus I stimulation is APC independent). Nevertheless, PMA plus I-induced expression of TNF-α and IFN-γ in self-HAhigh-exposed WT and Cbl-b−/− TCR Tg CD4 T cells were both equivalently depressed in comparison with viral-HA counterparts. IL-2 expression in self- HAhigh-exposed WT and Cbl-b−/− TCR Tg CD4 T cells were both rescued to control viral-HA levels by PMA plus I stimulation, consistent with our previous finding that IL-2 expression in tolerized CD4 T cells is limited by a blockage in TCR signaling that can be bypassed with PMA plus I (54). Cbl-b deficiency allows self-reactive CD4 T cells to massively expand, but does not confer resistance to anergy. CFSE-labeled Cbl-b−/− (Thy1.1/1.1) and WT (Thy1.1/1.2) TCR Tg CD4 T cells were adoptively cotransferred (5 × 105 each) into viral-HA and self-HAhigh recipients and then recovered from spleens on day 4. A, Representative histograms of CFSE dilution. B, Expansion is plotted as the total number of TCR Tg CD4 T cells. C, Representative plots of intracellular IL-2, TNF-α, and IFN-γ expression following restimulation with HA peptide or PMA plus I. D, Total cytokine expression corresponding to C. n = 3 for each group. When the WT and Cbl-b−/− TCR Tg CD4 T cells that were initially tolerized in self-HA recipients were relabeled with CFSE and retransferred into viral-HA secondary recipients, they both diluted CFSE (Fig. 6⇓A) and gained the capacity to express IL-2, TNF-α, and IFN-γ in amounts that were comparable to controls that had been twice exposed to viral-HA (Fig. 6⇓C). This confirmed our previous finding that tolerized TCR Tg CD4 T cells can be functionally resuscitated when removed from the source of tolerizing self-HA Ag and then exposed to an immunogenic (viral) form of HA (54). Importantly, the number of functionally resuscitated Cbl-b−/− TCR Tg CD4 T cells was more than 10-fold greater than the number of WT counterparts (Fig. 6⇓B). Thus, although Cbl-b deficiency might not confer resistance to anergy, it does appear to increase the number of self-reactive anergic CD4 T cells that have the potential to be functionally resuscitated. Cbl-b deficiency facilitates recovery of greater numbers of functionally resuscitated CD4 T cells. Pooled samples from Fig. 5 containing self-HA-tolerized or viral-HA-primed WT and Cbl-b−/− TCR Tg CD4 T cells were relabeled with CFSE and retransferred into viral-HA-infected NT secondary recipients and then recovered from spleens 4 days later. Each secondary recipient received 5 × 105 Cbl-b−/− TCR Tg CD4 T cells and the number of WT counterparts corresponding to the ratios described in Fig. 5B. A, Representative histograms of CFSE dilution. B, Expansion is plotted as the total number of TCR Tg CD4 T cells. C, Total intracellular IL-2, TNF-α, and IFN-γ expression following restimulation with HA peptide or PMA plus I. n = 3 per group. Although our data analyzing the functional status of Cbl-b−/− TCR Tg CD4 T cells exposed to tolerogenic forms of cognate Ag prompt a redefinition of the role of Cbl-b in regulating anergy, our CFSE dilution and expansion data confirm a recent finding regarding how Cbl-b regulates cell cycle progression. Thus, Cbl-b deficiency increased the number of divided (CFSElow) TCR Tg CD4 T cells exposed to low-level self-HA and a single bolus of soluble HA peptide (Fig. 7⇓A), yet the number of undivided (CFSEhigh) Cbl-b−/− and WT TCR Tg CD4 T cells was comparable (Fig. 7⇓B). Note that this analysis was not performed for viral-HA, self-HAhigh, or 4× HA peptide bolus groups because there were few undivided WT TCR Tg CD4 T cells to begin with. Nevertheless, the analysis of the self-HAlow and 1× soluble peptide groups confirms a recent finding by Zhang et al. (57) that Cbl-b regulates late cell cycle progression and/or survival, but not cell cycle entry. Cbl-b regulates CD4 T cell expansion, but not entry into cell cycle. The total number of divided (CFSElow, A) and undivided (CFSEhigh, B) TCR Tg CD4 T cells recovered from self-HAlow (calculated from data corresponding to Fig. 3) and 1× peptide (calculated from data corresponding to Fig. 4) recipients is shown. Cbl-b normally functions to limit Ag responsiveness of T cells by ubiquitinating TCR-inducible signaling molecules, and Cbl-b deficiency thus renders T cells hyperresponsive to antigenic stimulation and predisposes individuals toward developing autoimmunity (38, 39, 40, 42, 43, 46). In part because Cbl-b−/− T cells do not require CD28 costimulation to become activated (42, 43), and insufficient costimulation is a critical parameter that confers anergy induction over effector differentiation (31, 32, 33, 34, 35, 36, 37), it was hypothesized that Cbl-b−/− T cells would be resistant to anergy and thus help to explain why individuals lacking normal Cbl-b function develop autoimmunity. Consistent with this possibility, anergic T cells in various systems express increased Cbl-b (40, 47, 48), and Cbl-b−/− T cells have been reported to be resistant to anergy (40, 47). These studies, however, used either in vitro systems or in vivo systems in which anergy was induced with soluble Ag boluses. In the current study, we tested the role of Cbl-b in regulating anergy using a TCR Tg adoptive transfer system in which CD4 T cell peripheral tolerization is induced by a constitutively expressed self-Ag. Consistent with previous studies (40, 47, 48), WT anergic CD4 T cells expressed greater levels of Cbl-b mRNA compared with nontolerized Th1 effectors. Additionally, Cbl-b−/− CD4 T cells that entered cell cycle upon encountering cognate Ag underwent greater expansion compared with WT counterparts, a result that is also consistent with previous studies documenting that Cbl-b−/− T cells are hyperproliferative to antigenic stimulation (42, 43) because they exit cell cycle more slowly (57). What was not consistent with previous reports, however, is that despite the greatly augmented expansion that Cbl-b−/− CD4 T cells undergo immediately following their initial encounter with self-Ag, on a per cell basis they become equally limited in their abilities to express key cytokines in response to antigenic restimulation in comparison with WT counterparts. In this regard, Cbl-b appears to play a functionally similar role to CTLA-4 because CTLA-4−/− CD4 T cells in another in vivo peripheral tolerance model undergo enhanced late expansion, yet still become anergic (60). In addition to indicating that Cbl-b−/− CD4 T cells are not resistant to peripheral self-Ag-induced anergy, these current results reinforce our previous findings that the magnitude of the proliferative response immediately following initial Ag encounter does not determine anergy induction vs priming (49), and that massive T cell expansion is not necessarily linked to the development of effector functions (61). CD4 T cell anergy can be induced in vitro either by ligating the TCR (62) or directly activating the TCR-inducible Ca2+/NF-AT pathway pharmacologically (63) without providing costimulation. The cellular response leading to anergy in these in vitro models, however, is quite distinct from what occurs during the development of in vivo anergy induced by peripheral self-Ag. Thus, in vitro anergy develops in less than 1 day (62, 63) and results because the CD4 T cells do not enter cell cycle (64), whereas self-Ag-induced in vivo anergy is preceded by a vigorous proliferative phase of several days’ duration (49). Considering that proliferation per se is a critical determinant in regulating anergy in vitro (64), but not in vivo (49), and that Cbl-b clearly does regulate proliferation (42, 43, 57) (our current data), it is perhaps less surprising that Cbl-b plays a more critical role in regulating anergy in vitro than in vivo. It has been reported that Cbl-b−/− T cells are resistant to soluble Ag-induced anergy in vivo (40), although in our current study we found that Cbl-b−/− CD4 T cells exposed to soluble peptide boluses failed to develop effector functions, suggesting that they too were susceptible to anergy. A possible explanation for this discrepancy might be related to the ability of anergic T cells to regain function following the clearance of tolerizing Ag (54, 58, 59). Thus, depending on how long after the tolerizing soluble Ag is cleared that T cell function is assayed, the anergic state might already be reversed. Furthermore, a greater number of anergic Cbl-b−/− CD4 T cells might recover functionality than WT counterparts as a result of their enhanced initial expansion. This possibility is supported by our observation that although both Cbl-b−/− and WT CD4 T cells are susceptible to self-Ag-induced anergy, greater numbers of Cbl-b−/− CD4 T cells become functionally resuscitated when the tolerizing Ag is replaced with an immunogenic form of the same Ag. If Cbl-b−/− T cells are susceptible to anergy, why does Cbl-b deficiency predispose toward autoimmunity? Part of the explanation may relate to the increased resistance of Cbl-b−/− T cells to dominant/extrinsic peripheral tolerance factors such as TGF-β and Tregs (44, 45). Additionally, because self-reactive T cells can express effector functions transiently while they are undergoing peripheral tolerization (65, 66, 67), the augmented initial expansion of Cbl-b−/− T cells immediately following self-Ag recognition most likely results in a greater total amount of self-directed effector functions even though the effector activities of individual self-reactive T cells are not enhanced. Finally, oscillations in the expression levels of peripheral self-Ags could result in cycles of anergy induction, increased functional recovery, and ultimately autoimmunity when cognate self-Ag is re-expressed. ↵1 This work was supported by National Institutes of Health Grants AI057441 and CA109339 (to A.J.A.). ↵3 Abbreviations used in this paper: Treg, T regulatory cell; CT, threshold cycle; DC, dendritic cell; HA, hemagglutinin; NT, nontransgenic; PMA plus I, PMA plus ionomycin; Tg, transgenic; WT, wild type. Kappler, J., M. Roehm, P. Marrack. 1987. T cell tolerance by clonal elimination in the thymus. Cell 49: 273-280. Surh, C. D., J. Sprent. 1994. T-cell apoptosis detected in situ during positive and negative selection in the thymus. Nature 372: 100-103. Derbinski, J., A. Schulte, B. Kyewski, L. Klein. 2001. Promiscuous gene expression in medullary thymic epithelial cells mirrors the peripheral self. Nat. Immunol. 2: 1032-1039. Anderson, M. S., E. S. Venanzi, L. Klein, Z. Chen, S. P. Berzins, S. J. Turley, H. von Boehmer, R. Bronson, A. Dierich, C. Benoist, D. Mathis. 2002. Projection of an immunological self shadow within the thymus by the aire protein. Science 298: 1395-1401. Derbinski, J., S. Pinto, S. Rosch, K. Hexel, B. Kyewski. 2008. Promiscuous gene expression patterns in single medullary thymic epithelial cells argue for a stochastic mechanism. Proc. Natl. Acad. Sci. USA 105: 657-662. Bouneaud, C., P. Kourilsky, P. Bousso. 2000. Impact of negative selection on the T cell repertoire reactive to a self-peptide: a large fraction of T cell clones escapes clonal deletion. Immunity 13: 829-840. Von Budingen, H. C., N. Tanuma, P. Villoslada, J. C. Ouallet, S. L. Hauser, C. P. Genain. 2001. Immune responses against the myelin/oligodendrocyte glycoprotein in experimental autoimmune demyelination. J. Clin. Immunol. 21: 155-170. Rankin, A. L., A. J. Reed, S. Oh, C. Cozzo Picca, H. M. Guay, J. Larkin, III, L. Panarey, M. K. Aitken, B. Koeberlein, P. E. Lipsky, et al 2008. CD4+ T cells recognizing a single self-peptide expressed by APCs induce spontaneous autoimmune arthritis. J. Immunol. 180: 833-841. Lo, D., L. C. Burkly, R. A. Flavell, R. D. Palmiter, R. L. Brinster. 1989. Tolerance in transgenic mice expressing class II major histocompatibility complex on pancreatic acinar cells. J. Exp. Med. 170: 87-104. Ohashi, P. S.. 2002. T-cell signalling and autoimmunity: molecular mechanisms of disease. Nat. Rev. Immunol. 2: 427-438. Redmond, W. L., L. A. Sherman. 2005. Peripheral tolerance of CD8 T lymphocytes. Immunity 22: 275-284. Ohashi, P. S., S. Oehen, K. Buerki, H. Pircher, C. T. Ohashi, B. Odermatt, B. Malissen, R. M. Zinkernagel, H. Hengartner. 1991. Ablation of “tolerance” and induction of diabetes by virus infection in viral antigen transgenic mice. Cell 65: 305-317. Oldstone, M. B., M. Nerenberg, P. Southern, J. Price, H. Lewicki. 1991. Virus infection triggers insulin-dependent diabetes mellitus in a transgenic model: role of anti-self (virus) immune response. Cell 65: 319-331. Kurts, C., J. F. A. P. Miller, R. M. Subramaniam, F. R. Carbone, W. R. Heath. 1998. Major histocompatibility complex class I-restricted cross-presentation is biased towards high dose antigens and those released during cellular destruction. J. Exp. Med. 188: 409-414. Drake, C. G., A. D. Doody, M. A. Mihalyo, C. T. Huang, E. Kelleher, S. Ravi, E. L. Hipkiss, D. B. Flies, E. P. Kennedy, M. Long, et al 2005. Androgen ablation mitigates tolerance to a prostate/prostate cancer-restricted antigen. Cancer Cell 7: 239-249. Shevach, E. M.. 2001. Certified professionals: CD4+CD25+ suppressor T cells. J. Exp. Med. 193: F41-F46. Yamaguchi, T., K. Hirota, K. Nagahama, K. Ohkawa, T. Takahashi, T. Nomura, S. Sakaguchi. 2007. Control of immune responses by antigen-specific regulatory T cells expressing the folate receptor. Immunity 27: 145-159. Jordan, M. S., A. Boesteanu, A. J. Reed, A. L. Petrone, A. E. Holenbeck, M. A. Lerman, A. Naji, A. J. Caton. 2001. Thymic selection of CD4+CD25+ regulatory T cells induced by an agonist self-peptide. Nat. Immunol. 2: 301-306. Thorstenson, K. M., A. Khoruts. 2001. Generation of anergic and potentially immunoregulatory CD25+CD4 T cells in vivo after induction of peripheral tolerance with intravenous or oral antigen. J. Immunol. 167: 188-195. Apostolou, I., H. von Boehmer. 2004. In vivo instruction of suppressor commitment in naive T cells. J. Exp. Med. 199: 1401-1408. Nagata, S., P. Golstein. 1995. The Fas death factor. Science 267: 1449-1456. Krueger, A., S. C. Fas, S. Baumann, P. H. Krammer. 2003. The role of CD95 in the regulation of peripheral T-cell apoptosis. Immunol. Rev. 193: 58-69. Duke, R. C., J. J. Cohen. 1986. IL-2 addiction: withdrawal of growth factor activates a suicide program in dependent T cells. Lymphokine Res. 5: 289-299. Wells, A. D.. 2009. New insights into the molecular basis of T cell anergy: anergy factors, avoidance sensors, and epigenetic imprinting. J. Immunol. 182: 7331-7341. Webb, S., C. Morris, J. Sprent. 1990. Extrathymic tolerance of mature T cells: clonal elimination as a consequence of immunity. Cell 63: 1249-1256. Redmond, W. L., B. C. Marincek, L. A. Sherman. 2005. Distinct requirements for deletion versus anergy during CD8 T cell peripheral tolerance in vivo. J. Immunol. 174: 2046-2053. Matzinger, P.. 1994. Tolerance, danger, and the extended family. Annu. Rev. Immunol. 12: 991-1045. Hawiger, D., K. Inaba, Y. Dorsett, M. Guo, K. Mahnke, M. Rivera, J. V. Ravetch, R. M. Steinman, M. C. Nussenzweig. 2001. Dendritic cells induce peripheral T cell unresponsiveness under steady state conditions in vivo. J. Exp. Med. 194: 769-779. Janeway, C. A., Jr, R. Medzhitov. 2002. Innate immune recognition. Annu. Rev. Immunol. 20: 197-216. Ohnmacht, C., A. Pullner, S. B. King, I. Drexler, S. Meier, T. Brocker, D. Voehringer. 2009. Constitutive ablation of dendritic cells breaks self-tolerance of CD4 T cells and results in spontaneous fatal autoimmunity. J. Exp. Med. 206: 549-559. Schmidt, C. S., M. F. Mescher. 1999. Adjuvant effect of IL-12: conversion of peptide antigen administration from tolerizing to immunizing for CD8+ T cells in vivo. J. Immunol. 163: 2561-2567. Hagymasi, A. T., A. M. Slaiby, M. A. Mihalyo, H. Z. Qui, D. J. Zammit, L. Lefrancois, A. J. Adler. 2007. Steady state dendritic cells present parenchymal self-antigen and contribute to, but are not essential for, tolerization of naive and Th1 effector CD4 cells. J. Immunol. 179: 1524-1531. Mueller, D. L.. 2004. E3 ubiquitin ligases as T cell anergy factors. Nat. Immunol. 5: 883-890. Loeser, S., J. M. Penninger. 2007. Regulation of peripheral T cell tolerance by the E3 ubiquitin ligase Cbl-b. Semin. Immunol. 19: 206-214. Jeon, M. S., A. Atfield, K. Venuprasad, C. Krawczyk, R. Sarao, C. Elly, C. Yang, S. Arya, K. Bachmaier, L. Su, et al 2004. Essential role of the E3 ubiquitin ligase Cbl-b in T cell anergy induction. Immunity 21: 167-177. Fang, D., H. Y. Wang, N. Fang, Y. Altman, C. Elly, Y. C. Liu. 2001. Cbl-b, a RING-type E3 ubiquitin ligase, targets phosphatidylinositol 3-kinase for ubiquitination in T cells. J. Biol. Chem. 276: 4872-4878. Bachmaier, K., C. Krawczyk, I. Kozieradzki, Y. Y. Kong, T. Sasaki, A. Oliveira-dos-Santos, S. Mariathasan, D. Bouchard, A. Wakeham, A. Itie, et al 2000. Negative regulation of lymphocyte activation and autoimmunity by the molecular adaptor Cbl-b. Nature 403: 211-216. Chiang, Y. J., H. K. Kole, K. Brown, M. Naramura, S. Fukuhara, R. J. Hu, I. K. Jang, J. S. Gutkind, E. Shevach, H. Gu. 2000. Cbl-b regulates the CD28 dependence of T-cell activation. Nature 403: 216-220. Wohlfert, E. A., M. K. Callahan, R. B. Clark. 2004. Resistance to CD4+CD25+ regulatory T cells and TGF-β in Cbl-b−/− mice. J. Immunol. 173: 1059-1065. Wohlfert, E. A., L. Gorelik, R. Mittler, R. A. Flavell, R. B. Clark. 2006. Cutting edge: deficiency in the E3 ubiquitin ligase Cbl-b results in a multifunctional defect in T cell TGF-β sensitivity in vitro and in vivo. J. Immunol. 176: 1316-1320. Yokoi, N., K. Komeda, H. Y. Wang, H. Yano, K. Kitada, Y. Saitoh, Y. Seino, K. Yasuda, T. Serikawa, S. Seino. 2002. Cblb is a major susceptibility gene for rat type 1 diabetes mellitus. Nat. Genet. 31: 391-394. Heissmeyer, V., F. Macian, S. H. Im, R. Varma, S. Feske, K. Venuprasad, H. Gu, Y. C. Liu, M. L. Dustin, A. Rao. 2004. Calcineurin imposes T cell unresponsiveness through targeted proteolysis of signaling proteins. Nat. Immunol. 5: 255-265. Safford, M., S. Collins, M. A. Lutz, A. Allen, C. T. Huang, J. Kowalski, A. Blackford, M. R. Horton, C. Drake, R. H. Schwartz, J. D. Powell. 2005. Egr-2 and Egr-3 are negative regulators of T cell activation. Nat. Immunol. 6: 472-480. Higgins, A. D., M. A. Mihalyo, P. W. McGary, A. J. Adler. 2002. CD4 cell priming and tolerization are differentially programmed by APCs upon initial engagement. J. Immunol. 168: 5573-5581. Kirberg, J., A. Baron, S. Jakob, A. Rolink, K. Karjalainen, H. von Boehmer. 1994. Thymic selection of CD8+ single positive cells with a class II major histocompatibility complex-restricted receptor. J. Exp. Med. 180: 25-34. Adler, A. J., D. W. Marsh, G. S. Yochum, J. L. Guzzo, A. Nigam, W. G. Nelson, D. M. Pardoll. 1998. CD4+ T cell tolerance to parenchymal self-antigens requires presentation by bone marrow-derived antigen presenting cells. J. Exp. Med. 187: 1555-1564. Higgins, A. D., M. A. Mihalyo, A. J. Adler. 2002. Effector CD4 cells are tolerized upon exposure to parenchymal self-antigen. J. Immunol. 169: 3622-3629. Long, M., A. M. Slaiby, S. Wu, A. T. Hagymasi, M. A. Mihalyo, S. Bandyopadhyay, A. T. Vella, A. J. Adler. 2007. Histone acetylation at the Ifng promoter in tolerized CD4 cells is associated with increased IFN-γ expression during subsequent immunization to the same antigen. J. Immunol. 179: 5669-5677. Long, M., A. M. Slaiby, A. T. Hagymasi, M. A. Mihalyo, A. C. Lichtler, S. L. Reiner, A. J. Adler. 2006. T-bet down-modulation in tolerized Th1 effector CD4 cells confers a TCR-distal signaling defect that selectively impairs IFN-γ expression. J. Immunol. 176: 1036-1045. Long, M., A. D. Higgins, M. A. Mihalyo, A. J. Adler. 2003. 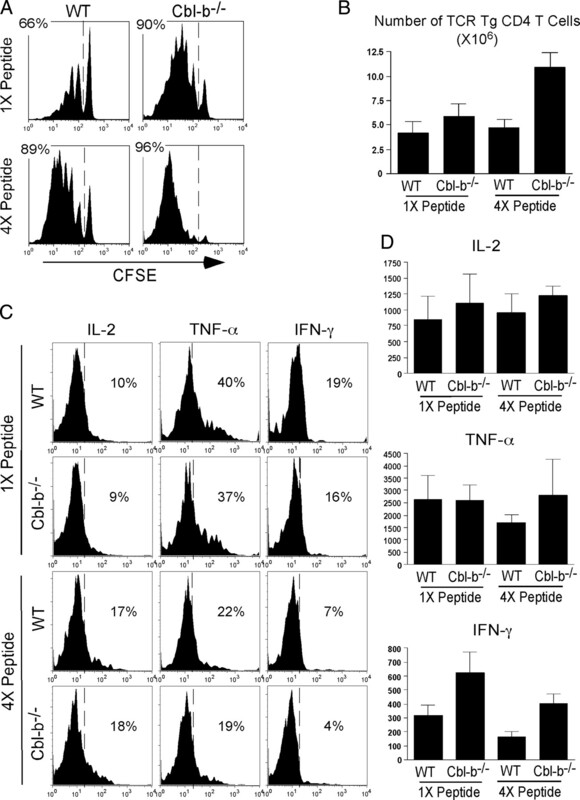 Effector CD4 cell tolerization is mediated through functional inactivation and involves preferential impairment of TNF-α and IFN-γ expression potentials. Cell. Immunol. 224: 114-121. Zhang, R., N. Zhang, D. L. Mueller. 2008. Casitas B-lineage lymphoma b inhibits antigen recognition and slows cell cycle progression at late times during CD4+ T cell clonal expansion. J. Immunol. 181: 5331-5339. Ramsdell, F., B. J. Fowlkes. 1992. Maintenance of in vivo tolerance by persistence of antigen. Science 257: 1130-1134. Inobe, M., R. H. Schwartz. 2004. 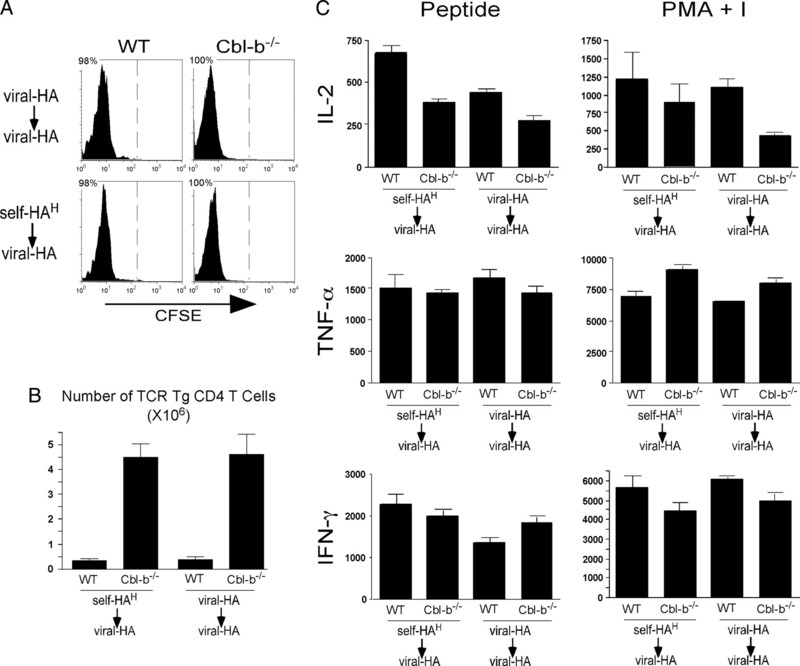 CTLA-4 engagement acts as a brake on CD4+ T cell proliferation and cytokine production but is not required for tuning T cell reactivity in adaptive tolerance. J. Immunol. 173: 7239-7248. Bandyopadhyay, S., M. Long, H. Z. Qui, A. T. Hagymasi, A. M. Slaiby, M. A. Mihalyo, H. L. Aguila, R. S. Mittler, A. T. Vella, A. J. Adler. 2008. Self-antigen prevents CD8 T cell effector differentiation by CD134 and CD137 dual costimulation. J. Immunol. 181: 7728-7737. Jenkins, M. K., R. H. Schwartz. 1987. Antigen presentation by chemically modified splenocytes induces antigen-specific T cell unresponsiveness in vitro and in vivo. J. Exp. Med. 165: 302-319. DeSilva, D. R., K. B. Urdahl, M. K. Jenkins. 1991. Clonal anergy is induced in vitro by T cell receptor occupancy in the absence of proliferation. J. Immunol. 147: 3261-3267. Kurts, C., H. Kosaka, F. R. Carbone, J. F. A. P. Miller, W. R. Heath. 1997. Class I-restricted cross-presentation of exogenous self-antigens leads to deletion of autoreactive CD8+ T cells. J. Exp. Med. 186: 239-245. Huang, C. T., D. L. Huso, Z. Lu, T. Wang, G. Zhou, E. P. Kennedy, C. G. Drake, D. J. Morgan, L. A. Sherman, A. D. Higgins, et al 2003. CD4+ T cells pass through an effector phase during the process of in vivo tolerance induction. J. Immunol. 170: 3945-3953. Mihalyo, M. A., A. D. Doody, J. P. McAleer, E. C. Nowak, M. Long, Y. Yang, A. J. Adler. 2004. In vivo cyclophosphamide and IL-2 treatment impedes self-antigen-induced effector CD4 cell tolerization: implications for adoptive immunotherapy. J. Immunol. 172: 5338-5345.